In December 2017, I held a public meeting so that local people could come along and have their say about Wirral Council's proposals for a golf resort in Hoylake. Wirral West MP Margaret Greenwood is encouraging her constituents who are struggling with their water bills to make use of support that may be available from United Utilities. Margaret Greenwood is celebrating the “fantastic success” of the campaign against Underground Coal Gasification (UCG) in the Dee estuary after the UCG licence expired. Margaret Greenwood MP met with representatives of Citizens Advice in Parliament and highlighted the importance of the service that they offer to people in Wirral West. In all, Citizens Advice helped over 460 people in Wirral in 2017. The main types of issues that people in Wirral West come to Citizens Advice for help with are benefits, Tax Credits and debt. 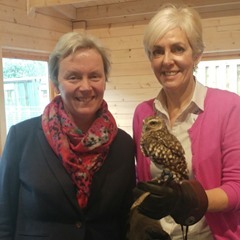 Wirral West MP Margaret Greenwood has visited the Royden Park Project where she met with a group of people with learning disabilities who were there to meet Anita Morris and an owl called Murray from an organisation called Hack Back.